On Tuesday following Memorial Day, we moved on to New Jersey, just across the Delaware River from Philadelphia, first home of our capital. We decided Philadelphia has the worst traffic, and is the hardest place to maneuver around; and we were in the Jeep! In spite of that, we thoroughly enjoyed visiting the Independence National Historic Park. We needed a timed ticket to visit the Independence Hall, so we visited the visitor center, which now houses the Liberty Bell. It was a highlight to actually see the icon of freedom, the Liberty Bell. It was a lot smaller than I had imagined it to be. During the Revolutionary War, Congress met in Philadelphia, the largest and richest city in America at the time. It became the temporary capital until the capital in DC was completed, 10 years later. The tour also included Congress Hall where I was sworn in as president, in the same spot George Washington was sworn in for his second term, and I did not even have to show my birth certificate!! and the Great Essentials, an exhibit of the countries most valuable papers: The Declaration of Independence, the Constitution, and the Articles of Confederation. But the pictures I took came out too blurry to see. This picture I got off the park service site. We were disappointed the Second Bank of the United States was closed the day we were there. It houses a Portrait Gallery of presidents as well as others from the revolutionary period. Not only is Philadelphia the home of the Second Bank, but it is also home of the First Bank of the United States, established in 1791. The building was built in 1797. The Quaker Meeting House was located just across the street from Benjamin Franklin’s grave. The closest home on this row of houses was once occupied by John and Dolley Todd until his death. She later married future president James Madison. So close to Washington’s Crossing and Valley Forge, we visited them as well: Until next Blog…..
Twice a year, there are two weeks between projects, created due to the way the first Friday falls. Typically it is once in the spring and once in the fall. This year it fell between our May and June jobs. So after our Baltimore, MD, job in May, we headed for Washington DC for Memorial Day weekend. It was such a pleasure to be in the capitol city! Since we have been to Washington before, we have seen the typical landmarks; so this time, we wanted to just enjoy the ambiance of the city. There were several wreath laying events we could have gone to, but chose these two events to highlight our weekend in DC. On Sunday night we attended the National Memorial Concert on the west lawn of the Capitol building. It was a very moving concert, with stories to honor those injured during the war as well as those who died. The following day, we attended the National Memorial Day Parade. The parade was a chronological display of wars America has fought, from the American Revolutionary War, right on up to today’s military. Although there is not pictures of everything in the parade, these pictures represent a few of the displays. War of 1812 was represented by a band…I did not get a picture of any of the 14 high school bands from all over. There was even one from a blind school in Ohio! And even Abe showed up! We were at the very beginning of the parade, and the VIP stand was right across from us, so we were able to hear the musical salutes and a special musical performance by the Smashing Pumpkins. The missing Idaho potato was also part of the entertainment. and today’s military, platoons from all 5 services. There were so many displays of patriotism, and being there was a great experience. It reminded us of how great this country really is. Author BonniePosted on June 23, 2015 November 9, 2016 Leave a comment on Memorial Day in Washington D.C. It has been almost a year since I have blogged. Not that the rest of 2014 was not busy! If I get a chance, I will do a blog or two about 2014 later. Meanwhile, after Paul had rotator cuff surgery and some other unrelated health issues, we were delayed from going back to work with MMAP until May. We both had the “hitch itch” by then! We have been to Child Evangelism Fellowship near Baltimore before, in 2012 and in 2013. The timing of this trip was a little disconcerting since the riots had just begun while we were on the way to the jobsite. The affected neighborhood is about 5 miles from where we were working and we felt very safe where we were. Although one day a bus stopped, let someone out and all of a sudden there were 5 patrol cars and an ambulance! This years project consisted of remodeling two offices, the 45′ long hallway, and repainting the entire outside of the building. That meant taking up old carpeting, texturizing the walls, painting, installing drop ceiling and new lights, and laying down new flooring in the two rooms. A new desk was the “icing on the cake”. They finished moving in and changed the desk and the printer around after I took the picture. The end results were fabulous! The hallway required the same removing carpeting, texturizing and painting walls, painting trim, painting and installing floor molding and chair railing, laying down new flooring, installing drop ceiling and new lighting. Again, we were all so pleased with the results! It made the hallway look so much brighter and fresh. Floor molding was also added after this picture was taken. Paul did a lot of unseen electrical work in the attic. The end result was really nice, clean look! and Levi, a very loyal volunteer who does anything he is asked! He was our little energizer bunny and encourager who spent three days with us, loading and taking a truck load of trash each day when he left. We tried to recruit him for MMAP, but our gain would be CEF loss! We even got Martha, the big cheese, outside painting! A couple of CEF teachers also donated a few hours to the outside painting! And we could not leave the little storage building out. The ladies took that on as a special project. It was only going to have the door painted, but on further inspection, we decided it needed the full treatment. At the end of the project the only exterior wall paint left out of the 15 gallons, had to be scrapped out! They figured the amount needed almost to the drop! We had to ask where the best crab cakes were… one was a deli we made a special day trip with the Rockhills to find, and then found a nice grassy place in a library parking lot to relax and enjoy them! I think we sat there for at least a couple of hours! The other was a sit down place, Timbuktu! Again a fun double date on Mother’s Day! It was a great project, none of us had worked together before, but as MMAPers, we formed friendships easily. We look forward to future jobs together! One day soon after Paul left for CA, my sister Susan called. She had called and got Paul and found out I was by myself and wanted to know if I was interested in a road trip. Well, ask me that, and most likely the answer will be yes! So after some planning, she flew out here on Friday night, and we took off Saturday morning for Asheville, N.C., to see the Biltmore Mansion! What a great trip. We found a church with an early service close by on Sunday morning, which we both thoroughly enjoyed. Although that should not be the criteria for choosing a church, it was not the only factor, and we both felt this one was it! And we were blessed! After service, we headed for the mansion. We took the self-guided audio tour inside the house, where we could not take pictures…. so hard not to…. it was an amazing place! columns with drainpipe that has a fish at the end, so water comes out of its mouth! We had a hard time deciding between two guided tours. We ultimately decided to do both! One on Sunday and the other on Monday. We found out if we signed up for one on the following day, our one day pass would be extended to the second day. So that is what we did. On Sunday, the Architect’s tour was fascinating: we toured the rooftop, balconies, and enjoyed fantastic views. we got up close and personal to the “grotesques”. which were gold covered when installed! Just a bit is still visible. as well as the one over the chandelier, which was a four story wonder! The small rooftop over the door was our exit. In that section, before descending narrow stairs, we could see horizontal copper pipe with wires wrapped around it and the roof tiles, showing how the slate roof was attached. The picture of the mansion from the garden (above), shows the roof top we were standing on. The slate roof is full of amazing details. It was guaranteed to last for 100 years…. guess what…. it is 24 years past that! They are now planning on how to replace it. We were able to see interior views under the roof, where copper tubing was run parallel and the slate is wired to it. This door entering the balcony is located in the south tower on the back side (picture above), leading on the left to Mr. Vanderbilt’s bathroom, and the right going to a living space. The Monday tour was the Butler’s tour. It was mostly inside, so could not take pictures. We toured the servants quarters, and some of the mechanical areas. The sub basement included the huge boilers, and an electrical room, wired for both AC and DC. Everything was state of the art. Even refrigerated cabinets in the kitchen…in 1889! One of the few outside areas we were at on the tour was a balcony facing the servants courtyard. The black circles on the brick are chutes where coal, then later oil was delivered to the subbasement for the boilers. The dark gray elongated room in the picture is the servants entrance. Although it was not on the original plans, it was added prior to the completion of the house. Both of the additional tours were fantastic and very informative. There are many buildings on the estate. Some private family homes; others include barns, the hotel, and Antlers Village and winery. then visited the village. The on-site hotel is in the background….not the one we stayed at. And something I have never seen before…. just outside the entrance to Biltmore, a grand piano at the Macdonald’s ! Biltmore is really an elegant place, with a touch of warmth not expected in such a large place. We were glad we stayed the second day there. After the Butler’s tour, we took the self guided tour again, to get a feel for where we were in relation to the rooms we saw in both of the tours. It was well worth visiting! and stopped to take pictures of Chimney Mt. It was cloudy, which made the mountain even more beautiful. We arrived at the library in time to have lunch there. The library grounds includes his childhood home which was moved there. as is Ruth Bell Graham. All of their spouses will also be buried there. We took the self-guided tour and visited the book store. It was a wonderful tribute to a great man of God. At the end, we were faced with a 20 x40 foot Kincaid painting of the cross. An awesome reminder of what Jesus did for us when He took away our sins! Again, well worth the visit! the old section of Knoxville. It was a great time of catching up! The trip was a great chance to spend some time alone not only as sisters, but as friends. I decided I have been having too much fun to blog. and the “cackling hens” as Andy calls us. Connie’s birthday is in May, and since our birthdays are close, we celebrate ours together, this year at Mere Bules. Yes, normally I do not share pictures of food, but the pancakes especially were special! Then we left for our semi-annual June trip to Coronado to enjoy the sun and fun on the beach. We flew out a week early to be able to see friends and relatives before meeting up with family at Coronado. Our dear friend, Gary Plueger, passed away on my birthday, and we were fortunate to be able to attend his burial while in Julian, an unofficial time of remembrance for us. His memorial service was later in the month so we would miss it. At the last minute, Paul was honored to be one of the pallbearers. Because Gary did not want a graveside service, there were just a handful of people there who wanted to say goodbye. We love the informal, old ways of doing things in Julian. We had a great time visiting dear friends there, and were reminded of how short time here on earth is. and to a climbing wall he visits weekly. We were impressed with his skill as we watched him climb to the top! Then we headed north, stopping along the way for more visits, and then to Redlands, catching up with Paul’s side of the family, sister Betty, aunt and uncle, and cousins. A great surprise was a visit with an old friend of our family who was in San Diego. She and her husband live in Washington, and I have not seen her since childhood! She made the very true comment that she remembered playing with Barbies every time we got together! Her parents and ours were friends in Canada, before either moved to S. CA. so there is a longtime connection! We had a great time, but we felt we needed another vacation after the whirlwind of visiting! We got back in time to celebrate 4th of July at Nate’s house, always a fun, exciting celebration! and went swimming with the grands. One of our stops while in CA was our rental in Borrego. and up to 113 degree weather, he is needing to stop when his body says to slow down. He has found a young man who is willing to work and he has been an encouragement to Paul, digging for the exterior plumbing, roof repair and some of the exterior painting that is needed. I miss Paul, but I am glad I am not there…. getting too old for heat and dust~! Besides, when my sister Susan found out I was alone, she suggested a road trip. So off we went ….. next blog will detail our adventure!! Author BonniePosted on August 5, 2014 November 9, 2016 Leave a comment on Vacation, playing and working! I can’t believe we have been home a week now! Prior to going to Iowa, we went home for four days. Paul needed to get a tooth replaced, and also during the time we were home, we made a trip to the ER with a flareup of Paul’s diverticulitis! He needs to stop scaring me! During that time, we also attended the ground breaking ceremony at the new site for the Church at Station Hill. We are excited to be a part of a new, fast-growing church. Part of me wants it to stay small. Growing up and as young marrieds, we were both part of small churches, and the fellowship you have is so sweet! But our “Sunday School Class” are empty-nesters and we have found great fellowship with them and look forward to getting to know them better. going through St. Louis. One of these days I want to stop and visit the arch. I heard you can go inside to the top! Definitely on the list! We arrived at Cedar Springs Wesleyan Camp a day early since we were coordinators. Two of the rigs took advantage of the “valet parking” when they got stuck in the mud. They were new sites on grass and it had recently rained. We had a great group of workers! Out of the five couples, two could only stay for two weeks, as they both had grandchildren graduating from high school in Colorado. But we took advantage of them while they were there! The priority was a staff cabin started last fall. Due to lack of eaves and some window issues, water was getting into the building. So the guys added eaves. They removed windows, corrected the leaking problem and reinstalled them. The construction and siding were completed! Redoing some electrical gave a chance to play with the big toys! Another project during the month was part of a renovation of the basement of the dining hall. They were removing carpeting from a meeting room and replacing it with carpet squares. Bunk rooms were also being constructed in the basement. About 1000 feet of carpet squares were installed as well as rubber kick board. painting undercoat plus two coats of green on two triple bunk beds! Sandy is a veteran sewer and quilter, so she designed and sewed a set of curtains for the new staff cabin. Another set will be made for the second staff cabin that is scheduled to be built. We went shopping for the material and came up with this inspirational material! and these beauties across from the park. Devotion time was special in front of the fireplace. We also took break there, and one day were blessed to have five associate MMAPers who live in the area come visit; the Bergs, .Betty Hanna and Larry Neely, who happens to be on the camp board. There is always an immediate kinship when meeting other MMAPers for the first time! Socializing is always a part of the project. We took time for a potluck and games. Our weekends off went quickly. There were repairs and maintenance issues on the RV that Paul was able to take care of, and we did a lot of relaxing. The camp is located on a beautiful, scenic site, right beside the Cedar River. where we saw a couple kayak down the river toward Charles City, about 15 miles away. We planned to take a canoe ride, but it was raining and stormy the days we were off and were able to do it. A Frank Lloyd Wright inspired home was on the property when it became a camp and is now the manager’s house. We could watch the eagle nest from there, looking across the river. We were told there were two babies (they are totally black until they are one or two years old), but we were only able to see one each time. One day we were enjoying our campfire, and saw the eagle and the baby were soaring above…but they were gone too fast to capture on camera! It was a great experience to see this eagle’s nest. One weekend, we took advantage of the $4 movie in Osage, and saw Heaven is For Real. And ate at Lucy’s Lunchbox, a tribute to Lucille Ball! Again, we were blessed to be a part of another ministry which was new to us. On the second weekend at Kentucky Mountain Bible College (KMBC), we headed East, toward Paintsville, KY., to see Butcher Holler, the childhood home of country sinnger, Loretta Lynn. We drove through the town, seeing the Mayo Mansion and church built by John Caldwell Calhoun Mayo, who came to Paintsville to teach, and soon started investing in mineral rights, eventually becoming Kentucky’s wealthiest citizen. The mansion is now a school. The church, Mayo Methodist Church, has an organ with more than 1000 pipes, which was donated by his good friend Andrew Carnegie. We visited the Highway 23 Museum, a tribute to Highway 23, designated National Scenic byway, honoring country music entertainers who were born or lived along Route 23. I was amazed at the numerous country music singers who grew up along this highway. Of the twelve listed country music entertainers who gained fame that we recognized, Billy Ray Cyrus, the Judd’s, Loretta Lynn, Crystal Gayle, and Ricky Skaggs all live in the Nashville area now. There may even be more! It took a while to find the Webb General Store to get a tour of the house where Loretta Lynn grew up. I regret that I have no picture of it. I was going to get it on the way out, but we left a different way. It was originally one of the company stores. We were told if we were lucky, her brother would give the tour. And we did get him! Directions: Go down a narrow but paved road to the fork in the road….. A rock with an arrow and Butcher Hollow written on it guides you to the left. The house, where the family of 8 lived, is a little way down the road. We were thrilled to meet Harold. When Paul and another tourist started looking at the well, he right away started talking about hand digging it, 30 feet down through rock. He pointed out a tree and a plant that was planted by his momma, back in the 20’s. Notice all of the signatures of visitors on the wall. He was such a gracious man and reminded us both of Paul’s dad. I could have stayed a lot longer visiting with him. After leaving there, we decided to go to the right of the rock that directed us to the left. 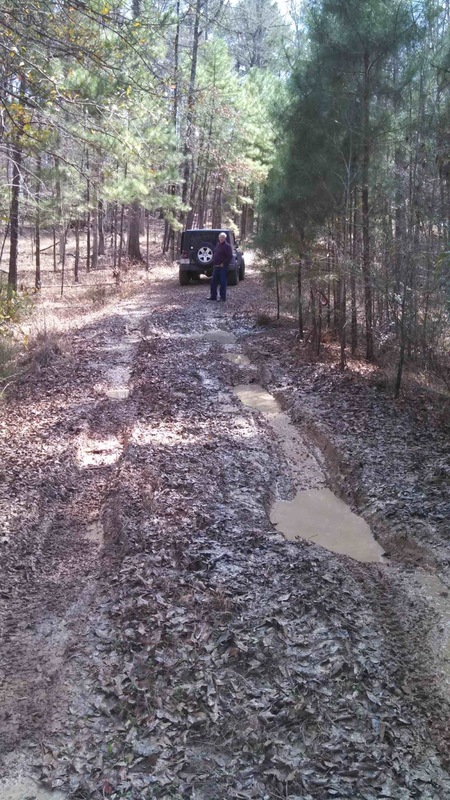 The jeep would not stay on the pavement, but had to follow the dirt roads through the mining area. The colors in the trees were absolutely beautiful. Exploring on the weekends while in Kentucky was a must. One weekend, we took the 14-mile South Fork Scenic Train ride. We started out at Stearns, Kentucky, where the old mining office is now a museum. before stopping at Blue Heron Mine, now a National Park. it was abandoned in 1962. There were several “ghost” buildings we could visit that had displays to commemorate what life in a mining town was like. Sand for the mine was stored here. After the ride, we stayed the night at the lodge in Cumberland Falls State Park. A side note: We are impressed with the state parks we have visited in the south. All have great amenities and the campgrounds are wonderful; clean, spacious and easy access! We took the rest of the afternoon and evening to just relax, and sit and read on the deck (didn’t even take a picture). It was so peaceful! The next morning we took a mile hike down to the waterfall before we left. What a treat! We were even blessed to be able to see the moonbow. It is a rainbow produced by the moon rather than the sun. Cumberland Falls claims to have the only moonbow in the Western Hemisphere. It only appears under certain conditions, when there is both a cloudless sky and a full moon. It is not quite as bright as a rainbow, and this was during the day. On the way home, we visited the birthplace of Kentucky Fried Chicken in Corbin, and ate lunch there. A replica of the first kitchen was on display. Some of the items were original. It was a great, relaxing weekend get away. Kentucky Mountain Bible College is in the Appalachian mountains in eastern Kentucky near Jackson. We were here two years ago and thoroughly enjoyed the project. This ministry prepares students for the mission field. Every student we talked to had a focus on missions. Besides being a college, we found it has a true heart for helping those in need and the result is the college also serves as a haven where challenges are being shared, support is being given and love abounds. The ladies were asked to share at an informal get together of female staff members who meet weekly to share, laugh and visit with each other. It was a great time of fellowship. When we were here two years ago, the project was to re-plumb, insulate and sheet rock in the home being renovated for the new head of facilities. We were invited to see the finished home, and it was unrecognizable! It came out so well, and some additional changes were made in the layout to accommodate the family. We were privileged and blessed to return! We had a great crew~ Everyone worked hard. We had the muddiest parking spot, but we also had the best view! This year, the project included finishing the upstairs on one side of a duplex. The family who will be moving in was so excited, the visited us everyday to see progress. added duct air return, and installed ducts and vents for HVAC in bathroom and living room. and the staircase wall also got a coat of paint. The bathroom needed backer board and tile as well as installation of toilet, sink and cabinet, light bar, mirror and towel bars. Bob did such a great job on this floor, he got to do another floor in an entry hall. Although I do not have a completed picture, Bill worked hard at getting the toilet, sink and cabinet, light bar, mirror, and towel bars installed. The finished room was very professional, clean and modern looking! Installation of all of the outlets and switches were finished, along with fans, lights and smoke detectors being installed. When John, our contact at KMBC found out Paul could do electrical, they had him move a power line that almost touched a metal roof. It was attached to a long-time temporary pole, and was very unsafe. Ladies were asked to deep clean two trailer homes recently vacated to prep for upcoming conference and then they will be used as residences for staff and married students. It took longer than I expected because we cleaned every surface, including windows, walls, cupboards and carpet. We finished cleaning the carpet in the morning, and they moved in beds that afternoon and it was used that week for another volunteer work group on campus. Paul and Art had so much fun with the Skytrack while doing the electrical work, they used it to help fall some trees that were dead and in danger of falling on a nearby home. They fell seven trees that were about 60-75’ high. All the guys got involved and I think they all enjoyed “playing in the woods” way too much! Everyone got to help! In the process they got the Skytrack stuck in the leach field below, but fortunately were able to get it unstuck very quickly! Ladies day out, we went to the small historic town of Hindman. It is home to the Appalachian Artisan Center. It included three different buildings with crafts made locally. The most interesting to all of us was the studio where building and repairing wooden instruments is taught. Guitars, dulcimers, banjos of different woods were displayed. We were treated to a tour and felt like we were experts by the time we left; we were given more information than we could ever use! So far, out of three jobs this year, this is the second one where it snowed! It didn’t last long, but it was fun to see. We were just thankful it was not snowing the day we left! Again, we feel so blessed to be able to work and serve in this capacity! Alexandria, Louisiana, and surrounding areas…. Louisianna is somehow different; a fun place to visit. Only in Louisianna do you have drive through Marguarita bars and signs warning to watch for bears, turtles, and alligators…..
Last time we were in northern Louisianna, in February, 2009, we visited most of the well known tourist sites, but there is always something more to see wherever we go. In nearby Alexandria, we visited the Silver Dollar (Cajun) Pawn shop of TV fame. It was so packed with every conceivable item. It was part museum, part antiques store! One day we visited the Melrose Plantation with the Hedmans. This plantation is one of several along the Cane River. It was one of the largest plantations in the United States owned by free blacks. This was the original home on the land, until the main house was built in 1833. It later became an artist/writer haven in 1884. As long as there was progress made on a project an artist or writer could continue living there. We had lunch at Natchedoches, at Lazones, famous for their fried meat pies; and I also had to try the fried green beans, both of which were really good! Another day we went south to Washington. It was founded in 1720, incorporated in 1835, and is the third oldest settlement in Louisianna. It was known as the largest steamboat port between New Orleans and St. Louis, Missouri. The last steamboat left in 1900, after the arrival of the railroad. Eighty percent of the buildings in the town are historic or of architectural significance. It is now known for their antique shops. But for us, we will remember the unexpected family friendly Mardi Gras parade. Vehicles were the theme, with army at the front of the parade. We were surprised to see Mickey and Minnie there! We took a trolly tour after the parade, got a feel for the town and some of the old homes, which were very diverse! The old 2 story school house was made into an antique mall, with 100 shops in the gym alone! And of course we had to get our off-road itch taken care of. We found a couple of these small cemeteries in the middle of the Kisatchie National Forest. The cold weather followed us home. I love seeing these in the winter! This is along our interstate highway! In the spring these icicles become mini waterfalls…. We love traveling around, but we love coming home to Tennessee…. Author BonniePosted on March 20, 2014 November 9, 2016 Leave a comment on Alexandria, Louisiana, and surrounding areas…. Karyn on June out and about!